Members of the single tax club in Des Moines, Iowa, decided in 1894 that they wanted to do more than just discuss the single tax theory. They wanted to build an actual community that would employ, as best they could, single tax principles. Still meeting in Iowa, they formulated their plans, wrote a constitution, and began seeking a site. Upon passage of the constitution one of the founding members said he believed there was a fair hope that the experiment would succeed. Thus the name for the utopian demonstration community: Fairhope. A committee consisting of James Bellangee and Shuah S. Mann was appointed to select a site for the community. After looking at several prospective sites in Arkansas, Alabama, Louisiana, Mississippi, Tennessee and Texas, the eastern shore of Mobile Bay was selected. 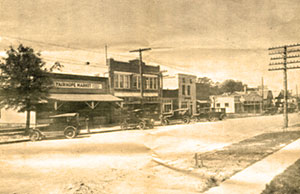 The Fairhope Industrial Association started buying land there, and in November of 1894 a group of 28 single taxers from Des Moines as well as other cities assembled in Fairhope to begin building their model community. 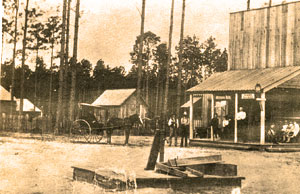 Because Henry George’s proposal was intended for implementation within the entire country, and the Fairhope experiment dealt with just one small community, significant changes from the original theory were required. Henry George never endorsed these changes or the Fairhope experiment, and declined all invitations to visit the community. Under George’s plan the land would remain in private ownership, and the full rental value would be taxed each year. Under the approach established in Fairhope, land was acquired by the Fairhope Industrial Association (the name was changed to the Fairhope Single Tax Corporation in 1904), and those who wanted to make use of a site would lease it from the Single Tax Corporation. The lease would be for 99 years, and was renewable. In theory, the Single Tax Corporation would charge a rent that attempted to capture the full annual rental value of the land. 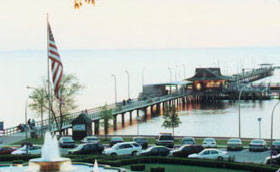 In practice, however, it was not necessary to charge such a high rent, because the Single Tax Corporation was receiving significant income from the usage fees on the Fairhope Pier. With the opening of the causeway in 1927, however, this income source dried up. In theory, when real estate was sold the selling price reflected the value of the improvements on the land, but not the value of the land itself. This was because the land (in theory) had no value to the person renting the land (i.e. the lessee) since the annual return on the full value of the land was (in theory) taken each year in land rent. There are cases where lessees renting sites with minimal improvements merely gave their leasehold back to the Single Tax Corporation rather than attempting to sell their right to the 99 year lease. For a time the Single Tax Corporation gave a rebate to lessees for certain other taxes they were required to pay, such as taxes on improvements or personal property. This was an attempt to move the system closer to the single tax (i.e. a tax only on land value) envisioned by Henry George. Whatever attempt there might have been to reap the full annual return on the value of the land, however, fell apart entirely during the Great Depression of the 1930’s. So many Fairhope families were not able to make their rent payments that the Single Tax Corporation relaxed its assessment and collection policies. This was the compassionate thing to do, but it did accelerate a precedent that has led to an even more drastic departure from the original theories of Henry George. 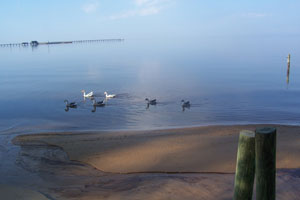 The Fairhope Single Tax Corporation today owns about 4,600 acres in and surrounding Fairhope. Those buying real estate on colony land, secure ownership of the improvements, but only a leasehold on the land. They pay rent to the Single Tax Corporation every year, but this rent in no way reflects the annual return on the value of the land. Rather, the rent reflects the total amount of city, school district, county, and state real estate taxes due, plus an amount added by the Single Tax Corporation. The add-on reflects the cost of administering the Single Tax Corporation office, plus an additional amount called a “demonstration fee”. This demonstration fee goes into a fund that is used to make donations to worthy projects that improve the community of Fairhope, and demonstrate the usefulness of the single tax approach. Among the types of projects supported by the demonstration fund have been 63 acres of bay front park lands, 11 acres for the Organic School plus some financial support in the early years, the Centennial Hall auditorium, 24 acres for Founders Park softball and soccer complex, a 43 acre city nature park, the original city hall/police station/jail location, funding for improving the emergency room facility at Thomas Hospital, significant funding for a performing arts center to be built in conjunction with the Fairhope High School, and improvements to roads, sidewalks, curbs and drainage. While the national tax system and the Alabama Constitution prohibit the implementation of a pure Georgist single tax in Fairhope, the social philosophy of Henry George and the early single taxers who settled in Fairhope have created the unique community we have today. Fairhope remains today a highly vital and attractive community, due largely to the impact of its status as a single tax colony, and to the philosophy, character, idealism, and vision of the early settlers attracted to Fairhope because of their enthusiasm for the single tax theory. The social theories of Henry George attracted progressive, free-thinking liberals and socialists to Fairhope. His economic theories attracted more conservative individuals. Together they have formed a diverse activist independent community that in turn attracted artists, writers, educators, and eccentrics of all types. It is this open and independent attitude that helps make Fairhope the wonderful community it is. Ed. What follows is a remarkable list of what can be done when landlords’ rent is eliminated. Donated the deeds to all the parks along the bay front, with reservations that they could only be used as parks, to the City of Fairhope. Donated the deed to the Wharf (Fairhope Pier) to the City of Fairhope. Donated the original utilities to the City of Fairhope. Paved the streets, sidewalks, and alleys in and around the City of Fairhope. Helped fund the new Fairhope Library (joint venture with the City of Fairhope). Provided the majority of the funding for the new Fairhope Museum (joint venture with the City of Fairhope). Provided ongoing direction for Knoll Park (joint venture with the City of Fairhope). Donated 24 acres for the new ball fields and soccer fields, now known as Founders Park. Helped fund the new emergency room at Thomas Hospital. Helped fund Centennial Hall on the Faulkner campus (joint venture with the City of Fairhope). Provided the funding for the equipment for the new, female athletic facility at Fairhope High School and Fairhope Middle School. Regularly sponsors a girls’ and a boys’ sports team in each City League. Provides support for the ongoing construction of Nature Park. Contributed to the Fairhope Arts Center addition. 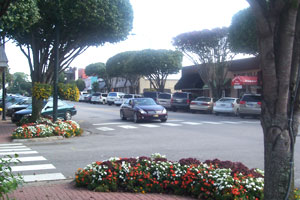 Provided numerous parking lots in downtown Fairhope. Contributed to the Fairhope Elementary School pavilion. Contributed to the Museum Plaza. Contributed to Alzheimer Wing at The Snook Center. Contributed to the Marietta Johnson statue. Major contributor to the Vietnam Memorial. Paved Windmill and Thompson Hall Roads (joint venture with the County). Worked to preserve history through the Bay Boat Model project. Built the Fairhope Elementary School playground and the Fairhope Intermediate School playground. Built the Knoll Park sidewalk along Bayview Avenue. Built the Volanta Street sidewalk and gave it to the City of Fairhope. Major contributor to the Fairhope baseball facility at Volanta Park. Major contributor to the new Fairhope High School Multi-Purpose Facility. Provided and funded the planting of trees at Founders Park. Provided $197,000.00 for the Rotary Boys and Girls Club expansion. Ensured public access to the White Avenue Park along Mobile Bay via a mutual, courted-ordered, settlement agreement. Built the Troyer Boothe road connecting Morphy Avenue to Nichols Avenue and gave it to the City of Fairhope. Funded sidewalks for Fairhope Elementary School. Built the sidewalks along Troyer Road and Boothe Road. Gave $1,004,000.00 to Thomas Hospital Foundation for the construction of the new Women’s Health/Birth Center. Built the White Avenue Park sidewalk. Built the Gayfer Estates sidewalk. Built the Morphy Avenue sidewalk. Contributed to the Fairhope Elementary School Special Needs playground. Provided funding for the Performing Arts Pavilion located on the Faulkner campus (joint venture with the City of Fairhope). Sponsor of the Alabama Coastal Bird Festival. Committed to $300,000.00 for the Fairhope Soccer Complex; City of Fairhope has committed a match of $300,000.00. Funding and building a new parking lot behind the Fairhope Public Library (in conjunction with the City of Fairhope). Committed $250,000.00 to the Fairhope Art Center for renovations and improvements. Paid for the pavers and materials to brick the Section Street sidewalk adjacent to the Fairhope Pharmacy from Fairhope Avenue to De La Mare Street. Built an additional portion of sidewalk connecting the White Avenue Park sidewalk to Nichols Avenue. Previous sponsor of the Honor Flight. Annually, sponsor of the Baldwin Pops Founders Day performance. Annually, supports the Fairhope Band program. Annually, supports the Weeks Bay Estuary. Annually, sponsor of the FSTC History Lecture Series. Annually, sponsor of the Thomas Hospital Golf Tournament. It is the Fairhope Single Tax Corporation’s goal to continue the work of our forefathers in order to make Fairhope a model community.